Hello friends! 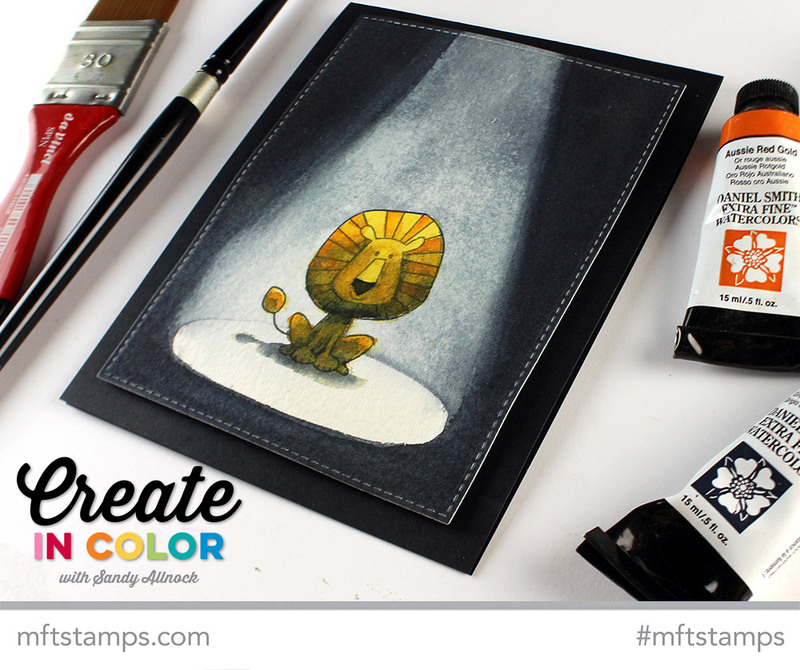 World Watercolor Month video #8 is over at MFT – hope you enjoy my lil dramatic lion! In this video I used a wide brush for the background – this is a Cosmo Spin 30, and it does a nice job of releasing pigment. Other flat brushes can do a similar thing butI also like that I can make a thin line with it sometimes as needed as well. My other brushes are Silver Black Velvet Round brushes, and I most often reach for a #8 and #12.
a fab water colour Sandy the lion’s smile sats it all! Well how fortuitous that your art today connected you with a dramatic lion because I love dramatic lions! I love drama! I love art! How much better can it ger? That is so cool Sandy! Love this video and the great idea of and how you put water on it. And your little brave lion, yes totally agry with you, he eat the poachers and normally I am a very friendly person for every other creature, but not for poachers. Great job Lion! Fab washing off technique, can’t see me trying that for a while though. What a great result for the poachers, wildlife 1, poachers 0 . AWESOME painting! Love the front and center-stage lion! Love this technique . . .and yeah, you do make it look easy. 🙂 Thanks Sandy! I never did find the video on this cute lion. Follow the link for the “dramatic lion” text. That was amazing to watch! Thanks for sharing!